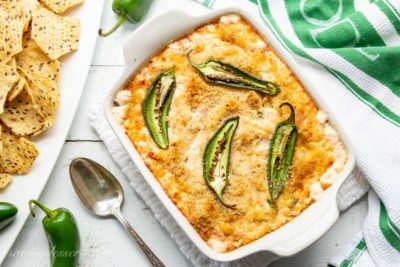 Jalapeño Popper Dip with a twist! 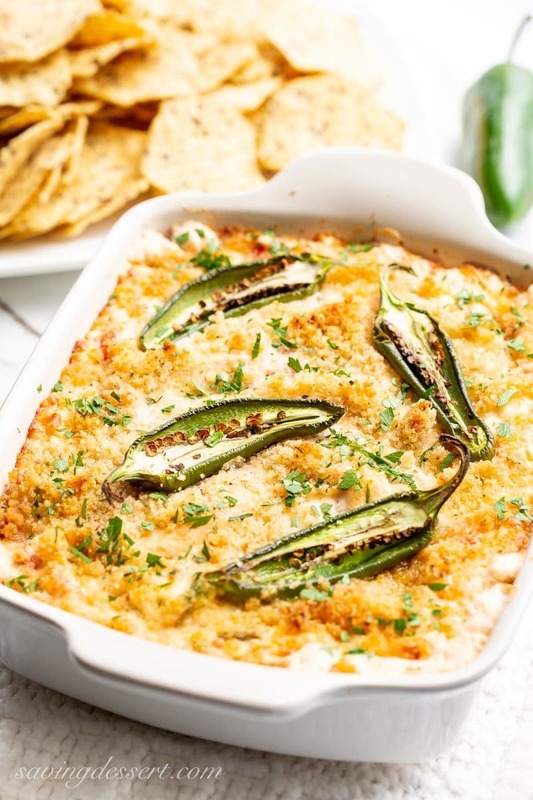 Easy, cheesy and delicious, this spicy dip will be your new favorite go-to recipe just in time for football, fall parties and garden fresh peppers! So what’s the twist on this delicious dip? I’ve added a can of Rotel Tomatoes to the mix along with the cream cheese, hot pepper Jack cheese, grated onion and mayonnaise. You won’t believe the incredible flavor those little bits of tomato impart, it’s really fantastic all around! A simple dip like this is not just for dipping you know! Can you believe football weather will be here next month? 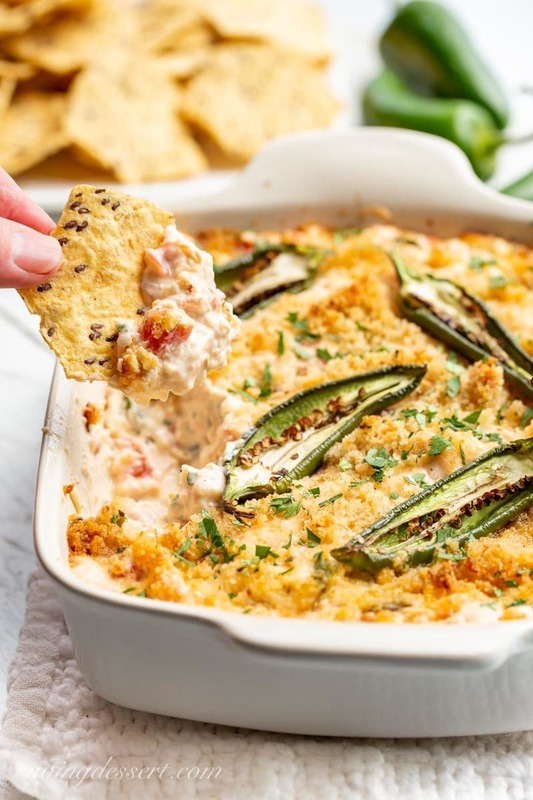 This will be great for all your sports crazed friends and family, because who can turn down hot cheesy dip?! You can make it ahead of time and bake when needed. Perfect for parties when you’d rather be hanging with your friends than making a mess in the kitchen. I made this dip extra hot by using hot pepper cheese, but feel free to substitute Monterey Jack Cheese or even sharp cheddar if you prefer. It’s all good and all delicious. 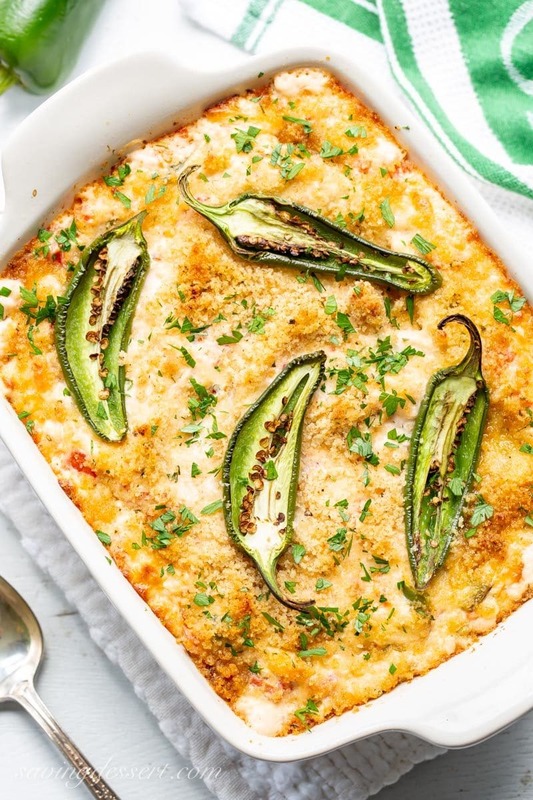 I love the consistency of this jalapeño popper dip and think you will too. It’s so creamy and plenty spicy without burning your mouth. Bring on the zing! Hot Spinach and Artichoke Dip – Cheesy, creamy and loaded with chunks of artichoke hearts, earthy spinach, garlic and sweet onion. Serve with your favorite crackers, toasted baguette slices or chips for a memorable appetizer hearty enough to feed a hungry crowd – with easy make ahead directions too! Click HERE to get the Hot Spinach and Artichoke Dip recipe and to read the post. Mom’s Party Cheeseball ~ every party needs an easy and delicious cheese ball. There’s nothing like the combination of mild, medium and sharp cheddar cheeses, all blended together with cream cheese and a few seasonings to please a hungry snacking crowd! This easy make-ahead appetizer holds up wonderfully for hours and is perfect served with crackers, bread, fruit and nuts. 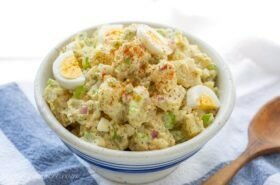 Click HERE to get the cheeseball recipe and to read the post. Easy Spicy Guacamole ~ don’t spend a small fortune on restaurant guacamole, when it’s much less expensive to make at home! Guacamole is incredibly delicious made fresh at your own table, hand crafted and seasoned just the way you like it … and it’s super easy to make too. Click HERE to get our delicious Guacamole Recipe. Easy, cheesy and delicious, this spicy dip will be your new favorite go-to recipe for all your dipping opportunities. Preheat oven to 400F. Line a baking sheet with foil. Lightly grease or coat a casserole dish, pie plate or skillet with vegetable cooking spray. Place the casserole dish on the foil lined baking sheet. Set aside. Pour the vegetable oil in a large non-stick skillet. Wipe out most of the oil and spread it around using a clean paper towel. Heat on medium-high. Place the jalapeño halves, cut side down in the skillet and cook until lightly charred. Remove from the skillet and cool slightly. Set 4 jalapeño halves aside for topping. With the remaining 8 jalapeño halves, remove the seeds and membranes and discard then dice the jalapeños into 1/2-inch pieces. In a large mixing bowl combine the diced jalapeños, cream cheese, parsley, onion, Rotel tomatoes, cheese and mayonnaise. Blend on medium speed with an electric mixer until combined. Add some of the reserved liquid from the tomatoes to thin if needed. 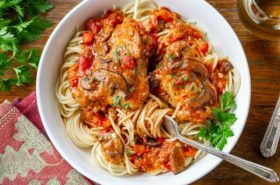 Pour into the prepared casserole dish and spread evenly. Mix together the bread crumbs, Parmesan and melted butter. Sprinkle over the cheese dip. Place the remaining 4 jalapeño halves, cut side up, on top of the dip. Press down gently into the cheese mixture. Sprinkle with red pepper flakes if using. Bake at 400F for 30 minutes or until dip is bubbly. Here are a few more appetizer recipes from some of our favorite bloggers. Love this healthy version of everyone’s favorite Homemade French Onion Dip Recipe from Rachel Cooks. I could eat my weight in this Bacon Ranch Corn Dip from Oh Sweet Basil. 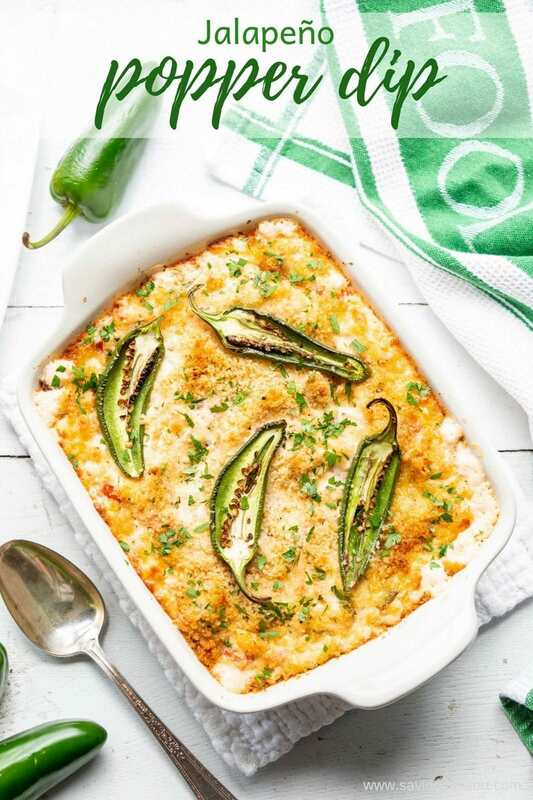 And here’s one more from Sue at The View from Great Island for Cheesy Hatch Green Chile Dip that looks and sounds utterly addictive! Do you recommend the original Rotel or do you recommend the mild or hot version? I know it depends on what you think you can handle heatwise, but I don’t want to ruin this dish by making it too hot! 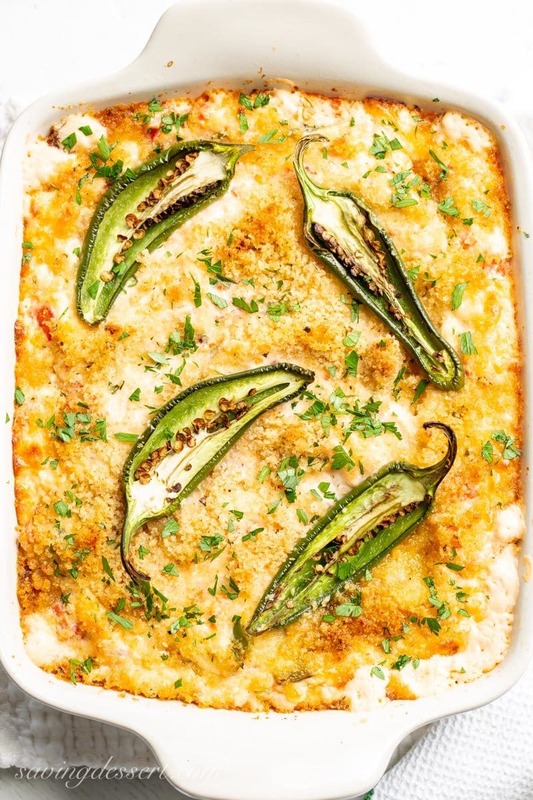 With jalapenos already in the recipe, maybe the mild version? Hi Penny – I recommend the ORIGINAL Rotel for this recipe. Enjoy! We just finished having this as a “snack” (could be a meal!) and it was DELICIOUS! Glad there are leftovers so we can enjoy it tomorrow. I didn’t have any fresh parsley but I had fresh dill and substituted that and I removed jalapeño seeds before charring because I didn’t read the recipe until I did it! I am new to your site and so glad I found it and signed up for emails! Hi Susan! 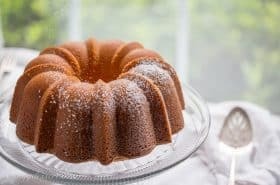 Welcome aboard – I’m so glad you are here and that you liked this recipe. I LOVE this dip and could make a meal out of it for sure 🙂 Happy snacking and please let me know if you ever have any questions. Now that your comment has been approved, you will show up when you comment on other posts. You ended up in my pending file 🙂 Enjoy! I love what you did with the jalapeños is beautiful! 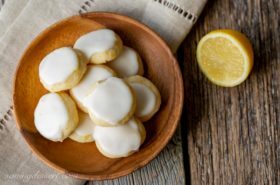 Love this recipe – thanks! Thanks Mimi – have a great weekend! My goodness, that looks delicious! I have friends who always order jalapeno poppers when they’re on the menu. 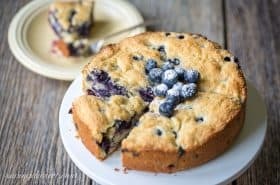 I have to make this for them! This looks amazing!! I’m always looking for recipes to keep when I have guests at home. This is a perfect Dip and imposible not to enjoy. Thanks Susan – you’re going to love it! This is my kinda dip! I can’t wait to try this and hopefully not eat the whole thing myself! I’m with you on this one Karly – I always hope for help on dips like this. So good! Hope you’ve had a wonderful summer. Thank you Sue! This is a delicious year-round dip, perfect for just about anytime. Rotel tomatoes add a ton of flavor to this dip Jennifer – I hate that you’ll have to use one of your precious cans but this is sooo good! Hope you give it a try. This looks like the kind of dip that would be impossible to stop eating! Yes it is Chris! Always amazed if we have leftovers 😉 Thanks so much! I have never made a warm dip..but I know I am going to love this one because it looks so creamy and deliciously addictive! It is totally addictive Angie! And I feel sure you will love a warm dip 😉 Happy weekend!